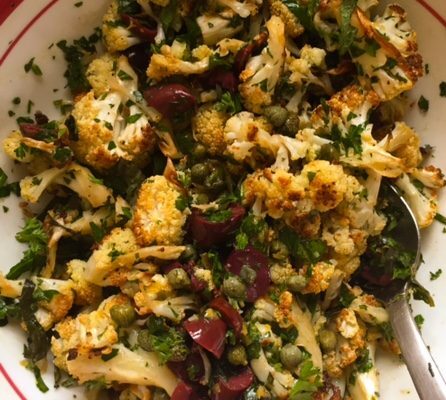 The vegetable of the year is cauliflower and I love it best roasted. The flavor of the vegetable changes completely with the natural sweetness emerging and the texture becoming crispy around the edges and tender inside. This dish can be served as part of a vegetarian meal or a side and is easily mutable with the addition of sun dried tomatoes, dill, feta, diced red pepper and on and on. In other words make this dish your own with the addition of whatever you have that works. Cauliflower is a bit of a blank slate so have fun with any flavor profile you desire. Cut the cauliflower into florets and then cut into small pieces. Transfer to a rimmed baking sheet. Drizzle with 3 tablespoons of the olive oil and season with salt and pepper and roast until crispy and browned on the edges, about 40 to 45 minutes. Meanwhile combine the lemon zest, lemon juice, capers, olives, parsley and remaining tablespoon of olive oil in a medium bowl. Add the cauliflower and season again with salt and pepper. Serve warm or at room temperature.